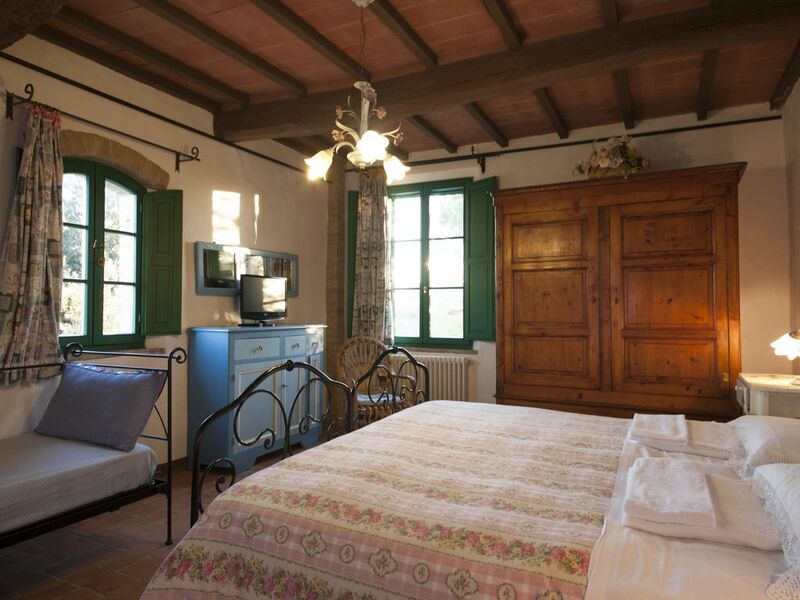 Agriturismo San Giorgio offers rooms and apartments (with private bathroom, Wi-Fi, swimming pool) immersed in the tranquility of the Sienese countryside. Just 6 km from Siena is ideally located for your relaxation and for visiting the main Tuscan tourist destinations. The country-chic style furniture, taken care of in details by the landlady, offers a comfortable and relaxing environment, able to make you feel at home. All rooms are equipped with TV, private bathroom, courtesy toiletries, tea and herbal teas. Guests have access to a large garden, swimming pool with panoramic views, children's playground, bike rental, barbecue, table tennis, table football, bowling alley and the company of our animals (hens, geese, peacocks, sheep). The farm has a totally family management and breakfast is served by the landlady with products of own production (cakes, fruit, jams, honey). It is located just 6 km from Siena along the "Francigena" road and along the "Eroica" permanent cycle-tourist route. It is also located within a wildlife repopulation zone and, if you go out for a walk along our fields of wheat and poppies, you can meet wild animals and breathe the scents of the earth, herbs and wild flowers. In starry nights you will have the opportunity to admire the constellations and the fireflies that illuminate the cultivated fields. The geographical position of the farm allows you to easily reach the Crete Senesi and the most prestigious places of Tuscany both in the north and south of Siena, such as: Florence (about 70 km), Pisa (about 120 km), Arezzo (about 80 km), San Gimignano (about 45 km), Volterra (about 60 km), Val d'Orcia with Montalcino (about 30 km), Pienza (about 45 km), Montepulciano (about 60 km), the spa towns (approx. 25 km) and the Tyrrhenian coast (about 90 km).